I am working to clear a friends computer of a spyware/malware infection. I have gotten most of it cleaned, however, at least part of what's left is Vundo. In addition to this infection, the icon for the main drive of the computer (C drive) has been changed to a red X. Before posting here, I read the malware cleaning guide post. As I previously mentioned I was successful at removing some of the infection. I have run (and now installed) McAfee A.V.S. I have also run super anti spyware, AVG anti spyware, Vundo fix (removes infected files, but they come back after reboot), and Panda online virus scan. I ran windows update and removed the old version of Java. I planned to wait to install the new Java until after the computer was cleaned. Your help with ridding this computer of its infection is greatly appreciated. O.k. I have downloaded the file to the desktop of the affected computer. I have not run it yet. At the bottom of your reply, you instruct me NOT to reboot the computer until you have reviewed the log. 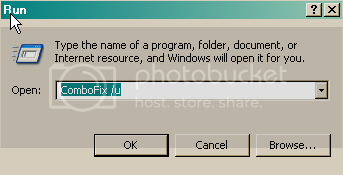 The last time I ran combofix, it did not ask if I wanted to reboot or not, it simply rebooted. Should I still drag and drop the Winx-XP file into comobfix and allow it to run? It will search your system drive looking for any modified .exe file and will produce a log for you. Refering to the picture above, drag the log it produced into RenV.exe and post the resulting report to your reply.